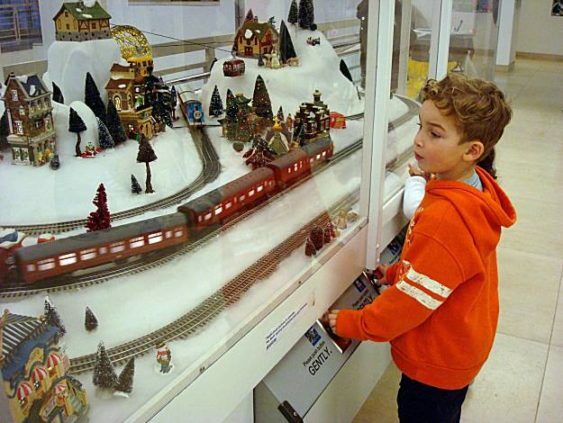 The San Francisco Public Library Main Children’s Center invites you to celebrate the return of a beloved annual tradition, when the holiday model train exhibit comes chugging around the bend on the second floor mezzanine. The exhibit will be here for you to enjoy beginning December 7 until January 3. Please note the library is closed Christmas Day, but open on December 24th. Kids of all ages love to press the buttons and watch the trains zoom through their colorful holiday village. This custom-built exhibit is a labor of love on the part of SFPL’s own Facilities and Engineering staff members, who assemble it and maintain it every year.